A Slice of Smith Life: Dear Blog: Meeting a Blogging Buddy (again), July 4th, and Edel15 !!!!!! 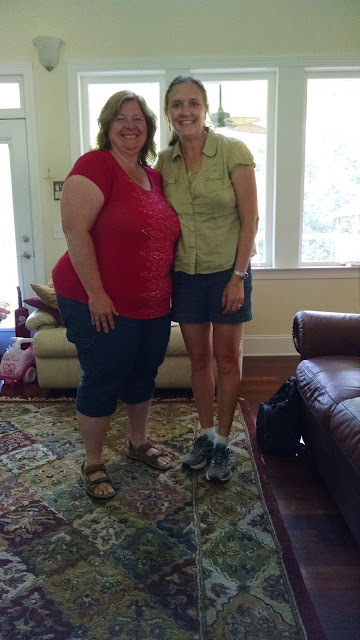 Dear Blog: Meeting a Blogging Buddy (again), July 4th, and Edel15 !!!!!! 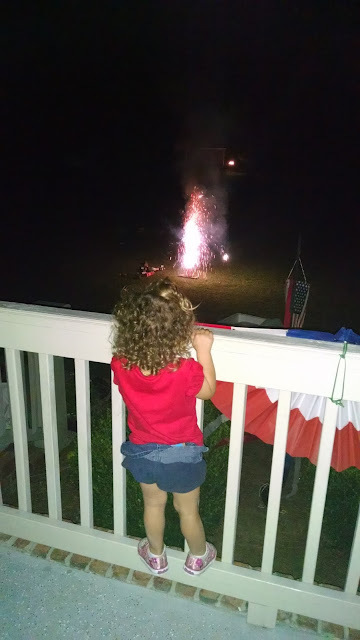 Our family had another wonderful July 4th celebration with family and friends! In the morning we hit the beach at the beach club we are members of with my parents. 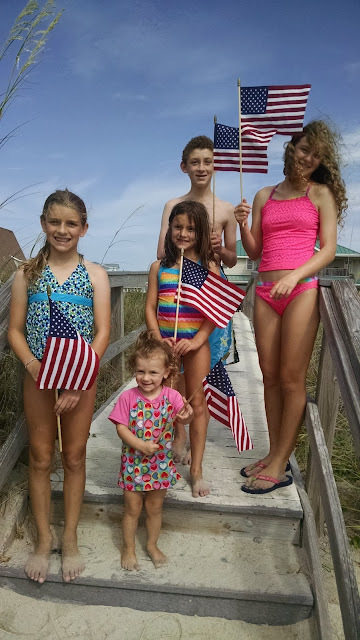 We had a fun time marching in the parade on the seashore, waving our flags following the drummer. Then my family participated in some running races in the sand. After eating a delicious lunch, we headed home to rest up for the evening festivities. 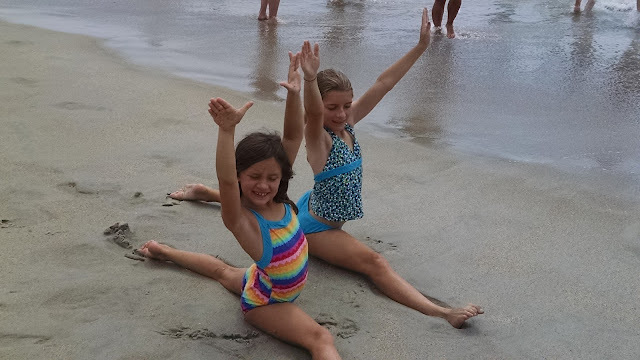 Gymnastics in the surf, sun and sand! In the evening we went to my in-laws house for dinner and yummy desserts. I brought my mixed fruit bowl of strawberries, blueberries and plums and I also made for the first time Red, White and Blue Berries that I spotted on Jessica's Catholic Cuisine site. 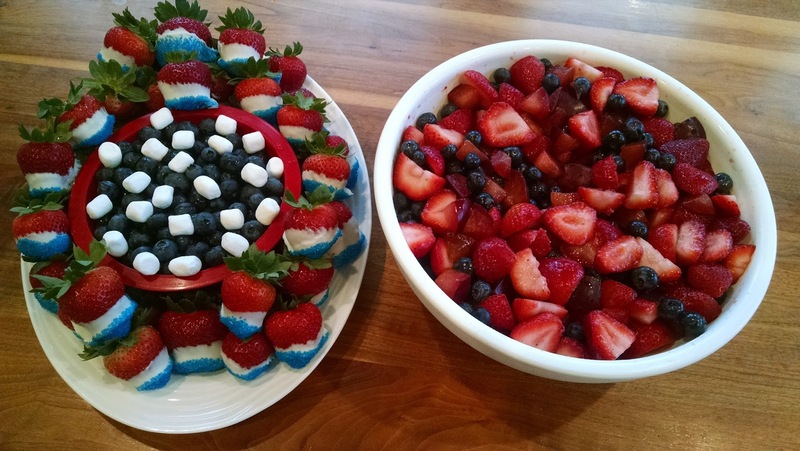 They were so easy and fun to make! Delicious too! 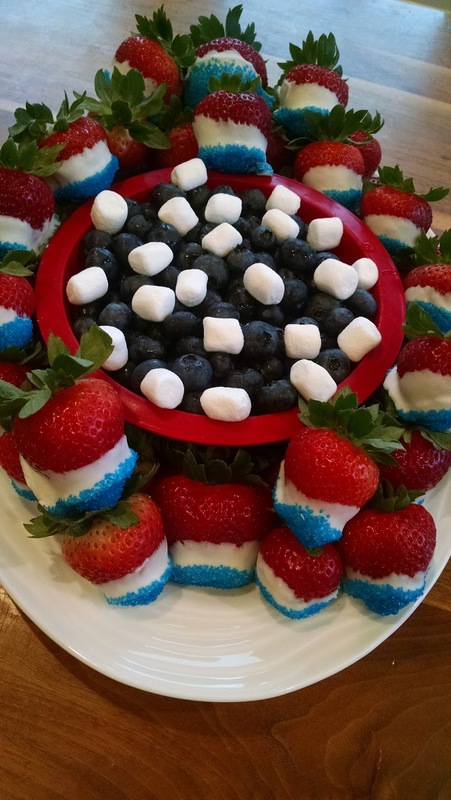 I made the centerpiece using a red plastic bowl and filled it with blueberries and some white marshmallows. 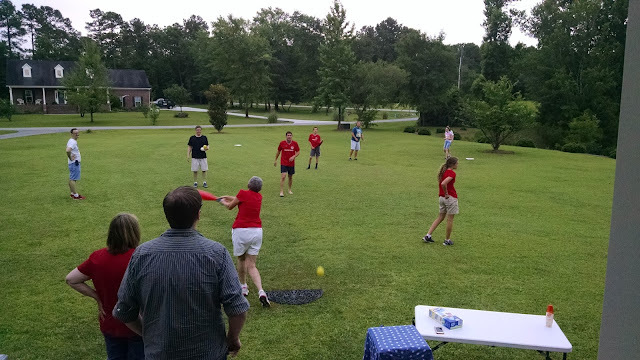 After dinner, family and friends gathered for our annual wiffle ball game! Always a good time had by all! That's my amazing mom hitting the ball for practice before the 35 guests went into the field or waited for their turn at bat after we split into 2 teams. 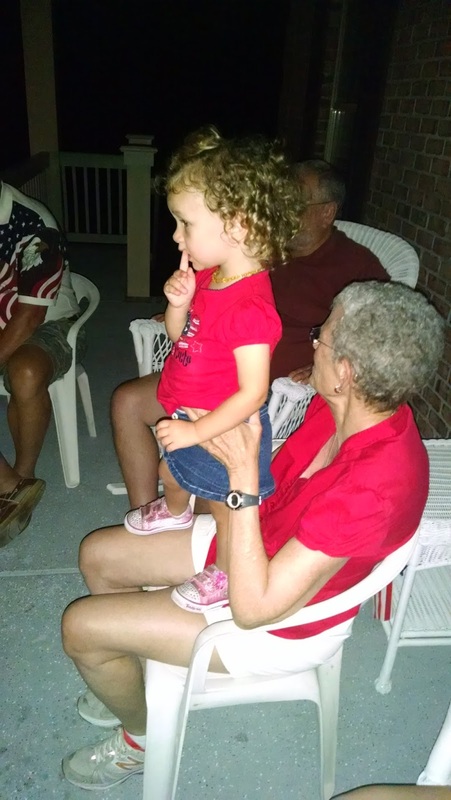 Here my Mom is holding our almost 2 year old as she watched the "big" fireworks show in the front yard. 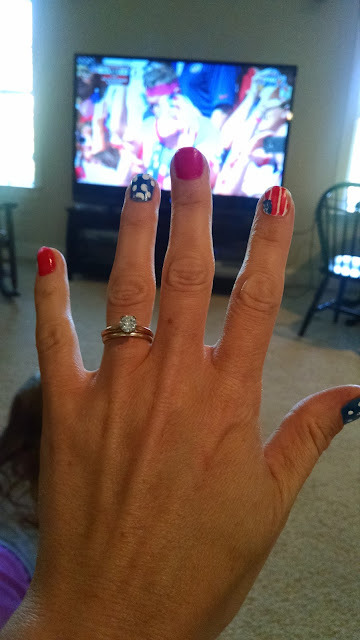 I'm showing off my patriotic nails here during the amazing US Women's World Cup game! I painted my nails which is a bit tricky. Congrats to a our amazing women's soccer team! What a win! USA! I'm very excited to see familiar faces and meet new friends and bloggers that I have been following for awhile! I'm really excited about the crazy shoe contest that will be happening Friday night. 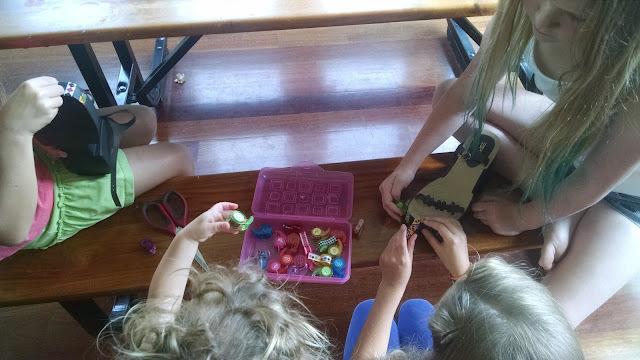 Here is a sneak peek of my shoes being worked on by some of my girls and their neighborhood friend. I had a blast finishing up my crazy shoe idea and I really like the craziness of them :) I want to give a big shout out and hug to my wonderful husband who will be holding down the fort back home with our crew while I'm away! 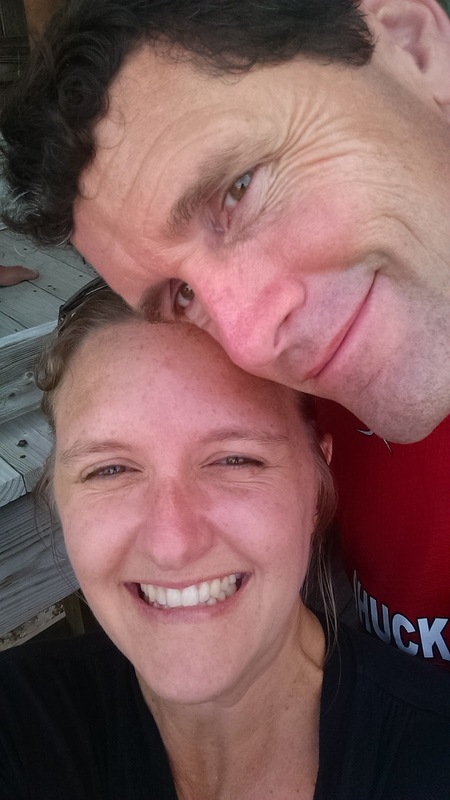 Thank you Honey for making this weekend possible for me! I'll get back Sunday, July 12, from Edel 15 and that is the day of my 18th wedding anniversary! Hoping you are having a blessed week!